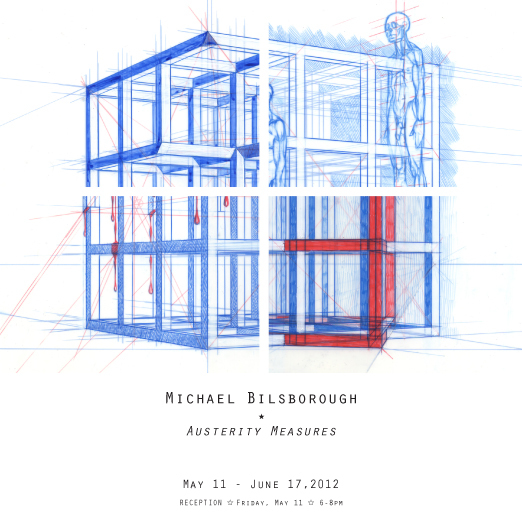 INVISIBLE-EXPORTS is pleased to present Austerity Measures, a new series of colored, technical drawings and an architectural intervention by Michael Bilsborough, and his second solo exhibition at the gallery. Through the recurring motif of a cubic lattice, Bilsborough works on translucent layers to generate dense images and complex forms. The results have optical depth, while the indelible procedural marking reveals the tests and decisions involved. Drawing is thinking. The images maintain sculptural integrity: beyond linear perspective, they also account for gravity, voids, and stress. They function as plausible models. Drawing is building. Each image requires drawing a “perfect cube” in perspective, and this learned skill, repeated, becomes a drill – a highly regulated performance. Through it, Bilsborough invents a spontaneous manipulation for the cube. Drawing is action. In this new series, Bilsborough diverges from his signature scenes of multi-figure orgies and rituals. The cerebral conditions of Austerity Measures are mostly stripped of human figures, though the images can evoke the body. The tensile armatures appear skeletal. The precise removals and dissections seem surgical. Each aspect of the geometric structures is a “face.” And a viewer’s gaze populates the drawings, as the navigable coordinate systems appeal to the rational brain. The drawings are models of model thinking: demonstrative, credible, multi-coordinate, resistant to inefficient obfuscating and presumptions. For the thinking individual, shaping thoughts might be the best response to a problem. After all, part of the problem might be the way one thinks. Michael Bilsborough (b. 1979) lives and works In New York. He grew up in the California desert, studied philosophy at Columbia University, and earned an MFA at the School of Visual Arts. He completed the Workspace Residency of Lower Manhattan Cultural Council in 2006-7 and received a Visual Arts Grant from the Rema Hort Mann Foundation in 2006. He writes a weekly blog for the School of Visual Arts and recently contributed an essay to the monograph on Sean Landers, Improbable History, which was published by JRP Ringier in 2011.